ZIPLINE balances an attractive, thick-made phenotype with a gentle disposition and a pedigree loaded with maternal productivity and breed-leading carcass traits. His mother is an ASA Silver Dam who has an average weaning ratio of 103 on her 4 calves and is one of our strongest carcass trait females. Her progeny have an average %IMF ratio of 110 and average ribeye area ratio of 105. 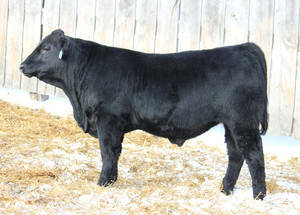 His Ribeye Area, Marbling, and Fat Thickness EPD's are all in the top 10% of the Salers breed. Quad-polled and smooth polled. 50% Angus.